The baby stand normally has three legs made of eigher aluminium or steel and a recieving pin measureing 5/8" in diameter. A Baby Stand is normally exclusive to the lighting department but many other departments use modified or off-the-shelf baby stands for their gear. A Baby stand is technically any stand that has three legs that will fold up into the main riser base and also have a 5/8" baby pin machined at the top to receive any 5/8" baby female receiver mounting. There are low baby stands that are referred to as Premie stands. There are also variations of all aluminum, all steel or mixtures of some aluminum and steel parts to save weight or increase strength where needed. One mixed use of steel and aluminum is the 3-riser baby stand. Often a lamp such as a Baby-Junior tungsten light is placed on a 3-riser baby stand. When the 3-riser stand is extended to it's full extension on all three risers, each riser will bend slightly giving way to the slight weight offset of the lamp. 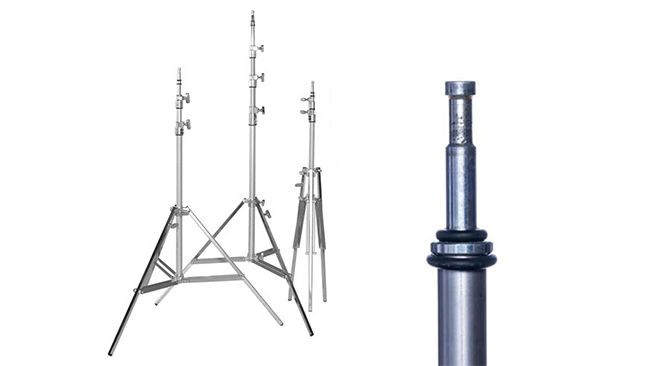 There have been many occurrences where when using an all aluminum 3-riser stand, the top riser will bend and fold under the weight of a lamp such as the baby-junior. Having a top rise of a stand fail and bend is of course a danger to anyone on set. Many would think to only carry full steel construction 3-riser baby stands where all three risers are made of steel as well as the legs themselves. When you work on a lighting crew however, you will quickly notice how heavy a 3-riser all-steel baby stand is to pack, carry and repeatedly break down and move on a regular basis.